Motorola's Droid X goes on sale Thursday, and it couldn't have planned a better week to debut the iPhone 4 alternative. Anti-iPhone 4 rhetoric is growing in volume. There is the Consumer Reports slam on Apple's iPhone 4, a judge that just granted a lawsuit against Apple and AT&T class action status, and consumer sentiment that Apple is in faulty-antenna denial. Call it a perfect storm of anti iPhone 4 propaganda, but it could lay the groundwork for one of the most successful Android phone launches yet. 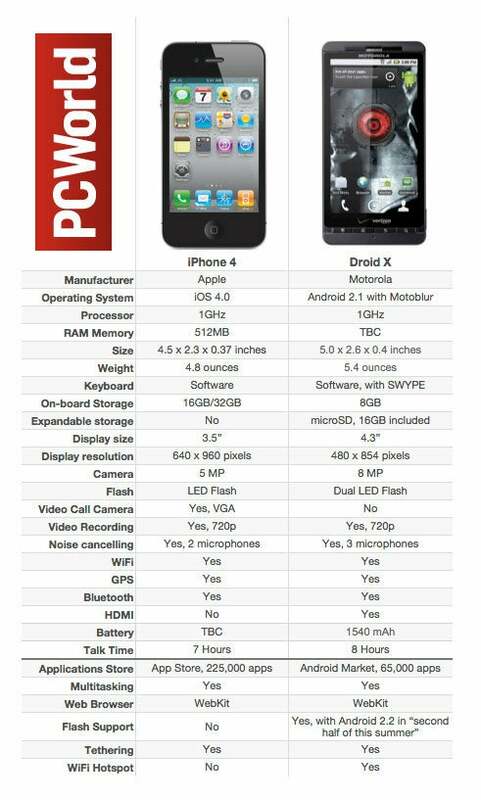 After all, the Droid X is a pretty impressive phone in its own right - iPhone flubs or not. On Monday, Consumer Reports confirmed what a number of disgruntled Apple customers have been complaining about since the day the iPhone 4 hit the shelves--holding the phone in a particular way will cause the phone to lose signal strength and even drop calls. The iPhone 4, which officially landed in consumer's hands less than a month ago, has been criticized in the press for its design flaws--including antenna problems and screen discoloration. Its antenna problems particularly stood out--not only because one of the phone's selling points was its new antenna design, but also because users found that holding the phone as a normal person might hold a cell phone was what caused the problems. Apple first released a statement regarding the iPhone 4's antenna problems, basically trying to pawn the problem off as a "software issue." According to Apple, the iPhone software formula for displaying signal bars was just "totally wrong." A few days later, Apple admitted that there might be a hardware problem, and that users should simply avoid touching the lower left corner of the phone or purchase a $29 "bumper" case to fix the issue. Consumer Reports confirmed Monday (after a series of controlled tests) that the issue is, in fact, a hardware problem--the iPhone 4 has reception problems and is not recommended by Consumer Reports. Even before Consumer Reports' report on the hardware issues, consumers were looking to take action--class-action lawsuits are lining up at Apple's and AT&T's door, including one from Maryland and one from Northern California. It appears that Verizon has already recognized the potential marketing goldmine in the iPhone 4's issues--on June 30, Verizon ran a full-page ad in the New York Times that included a subtle barb directed at Apple. "And most importantly, it comes with a double antenna design," the ad read, "The kind that allows you to hold the phone any way you like and use it just about anywhere to make crystal clear calls." Zing! The Motorola Droid X, which features a 1GHz processor, a 4.3-inch multi-touch display, and an 8MP camera with a dual LED flash and 720p video recording, hits the shelves on Wednesday. It's an impressive alternative to the iPhone 4. Take a look at how it matches up agains the iPhone 4 in this chart (click to enlarge). Even if we don't see any, um, "friendly" iPhone-bashing from Verizon and Motorola, it looks like it won't matter--Apple's taken care of that itself by releasing a faulty product and then denying it. With all of the current and unresolved iPhone 4 woes, it looks like the Droid X is breaking into the market at the perfect time. But, you never know. What do you think? Will the iPhone 4's issues help, hurt, or have little to no effect on the Droid X release?